Parenting has never been effortless and things get more complicated when you are a working mom. You always have little time for yourself when you can enjoy your company alone. At this time of the year, we are going to buy gifts for each other. So, if you are planning to buy a gift for a working mom, make sure you give something that can give them ease and relaxation rather than the old styled household items and crockery. We have compiled here a list of some unique and valuable gifts that are perfect for working moms. Internet is an amazing place where you can spend your hours without getting bored. At the same time, it can be scary for kids and younger children. The circle monitoring device enables parents to monitor family’s internet connected device. They can also set time limits, monitor kids’ internet usage and filter online content. There is also an amazing monitoring application named TheOneSpy that is particularly intended for working moms to remotely and secretly supervise digital behavior of their children, especially secret texting codes of teens. It lets them monitor and manage their kids’ mobile phones and computers without physical access. We are sure moms gonna love to have this. Help working moms track their fitness with Fitbit’s fitness tracker. This gadget comes preloaded with multiple features including daily reminders, fitness goals and challenges. It can even track your sleep cycle to help you get the needed sleeping hours. A dirty and messy home can be dreadful and we are sure working moms think the same. So, if you are planning for something unusual why not to try Amazon’s house cleaning service? This service usually involves cleaning of floors, trash removal, kitchen and bathroom cleaning. Just book and appointment, provide information about your home and hours required for the service. Taking of your kids and giving time to your job simultaneously is hectic and many working moms can relate. If you know someone having such hectic schedule, let them relax their muscles and pain with Mat and Pillow set of Accupressure. This is amazing to use at night to relive back pain. Everyone would love to have a hair stlyer that dries and styles hair at the same time. The hair Style by Airwrap saves your time and helps you look the best without damaging your hair. We recommend this gift for working moms this holiday season. This is what every mom needs at least once a month. Giving a working mom a day at spa can be the best gift she would love to have. Gift her a few hours of relaxation to forget her stress for a time being. But before you make a booking, make sure she does not have already booked her spa at that day. This may look boring to give a mop as a gift but this actually is not. The working moms would love to have a high-tech device that can help them clean home quicker. You can gift her BISSELL PowerFresh Lift-Off mop that is convenient to use, reasonably priced and cleans everything. The best gift probably moms can have is a day out with friends or spouse. For this, they definitely need someone for child care. If you have a close relationship or strong bonding with working mom, you can offer her a few hours of freedom by offering child care. The moms are hard worker both at work and home, so they definitely deserve to be appreciated for their efforts with a gift. 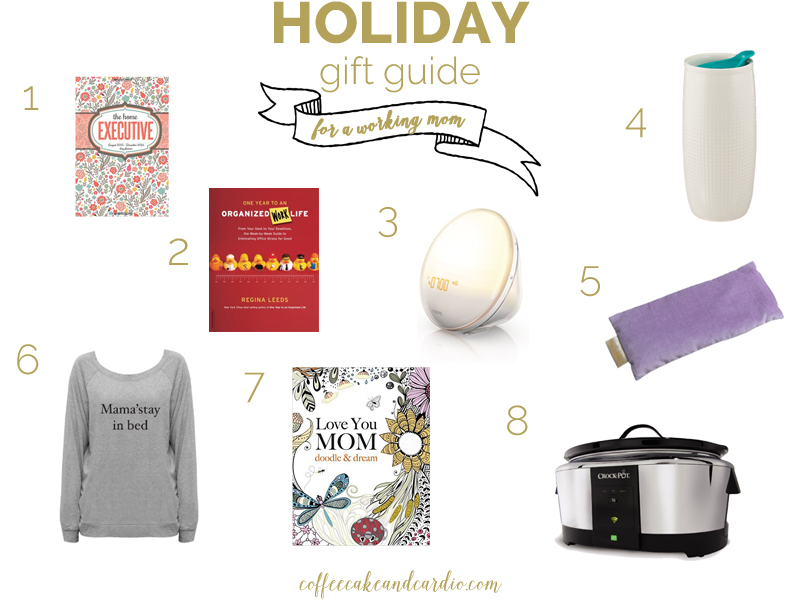 We hope our list of holiday gift ideas would help you choose the best for a working mom.